To add Employees, go to the [Admin] > [Employees]. When setting up an employee, there are a plethora of settings and permissions that you have to option to dole out. Lets tackle these one by one and start with the obvious ones. Note: Only admins have the access to add/edit employees so all of these settings on this page are only accessible by admins. Names: First of all, give your employee a First Name and Last Name. If you need to use a title or middle name, you can add these in the first name entry form. Role: Choose Employee or Admin. Admins automatically have access to everything in the system, while Employees will only be able to see their timesheets and schedules on the app and online, clock in on the app only by default, and any other permissions you give them. Each Employee also has a set of features which can be enabled or disabled, which are explained later in this article. Any Employee role user can also be given manager permissions to allow them to access time sheets and schedules for specific employees such as a specific department or business location. Note: The employees can only add a job name and job number. Things like the description and address have to be added by an admin on the desktop website. Allow Task Adding Via Mobile: Same idea as job adding. 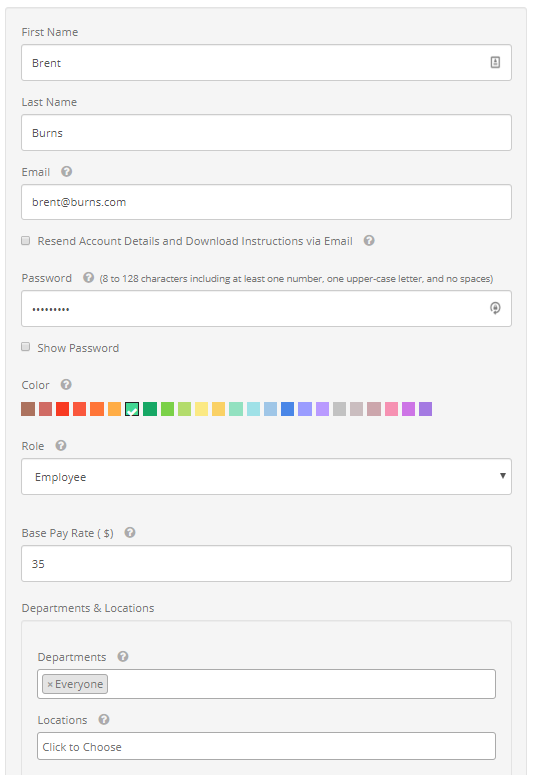 This gives the employees the power to quickly add a task in the field. When choosing a task to clock into, they can click the "+" in the upper right corner and they can add a task to clock into. 🕑Note: The employees can only add a task name and task number. Things like the out of bounds/overtime exemption have to be added by an admin on the desktop website. Note: That no GPS locations will be provided with a manually added shift. Instead there will be red X's that state "Manually Added: Location Unavailable." Note: That employee locations will ONLY be recorded while an employee is clocked in for work. When clocked out or on break, locations are NOT tracked. Note: Only an admin has the ability to change/view a PIN and they have to be unique numbers.